As a Bride, you fill your bridal party with the women who are special to you for a multitude of reasons. It's probably a mix of sisters, best friends, cousins, soon to be sister in laws, etc. After the dress, the hair and make up, nails, shoes, accessories, etc. these girls certainly have shelled out a lot of money, and many Bride's want to come up with something nice to give them as a Thank You for not only being in the wedding, but for being such a great friend during this time. 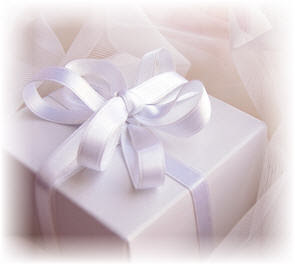 We found a wide variety of great Bridesmaid presents and have listed our top ten below. Maybe it can give you some inspiration or is exactly what you had been looking for! 10. Gift Certificate- If your not sure exactly what to get your bridal party but want to make sure it's something everyone will use, consider a gift certificate to a nice restaurant or fun boutique. Make it something they wouldn't normally get for themselves and they will find it to be a very nice treat. 9. Gift Basket- If your bridal party is made up of a group of totally different girls, make them each an individual gift basket personalized for them! Someone who loves to cook? Find a great selection of unique spices, dips, marinades etc. at William Sonoma! Someone who is a total girly girl? Put together a basket of OPI's latest nail polish colors, some hand lotion, a candle, and you've got a great gift! 8. Tickets to a Broadway show, Sports game, or Concert- You know these girls better than anyone! Get them tickets to that Red Sox v. Yankees game they would die to see, or seats to at the Garden for GaGa's next tour! 7. A designer purse, wallet, or wristlet- A lot of designers have some great new Summer styles out and wouldn't your bridesmaids be excited to get the latest colorful print wristlet they had been eyeing? 6. Perfume- Whether you already know your friend's perfect scents, or you find a beautiful one you think she will love, pick out a nice bottle of perfume and give your Bridesmaid's something sweet. 5. Spa day- Consider treating your bridal party to a day at the spa a day or two before the weekend. Everyone will look their best for your big day, and have a fun relaxing time together too! 4. Chocolates- Work with a great Chocolatier and pick out some decadent gourmet chocolates to treat your bridal party to. It's something they would never buy themselves, but will certainly enjoy. 3. Jewelry- Pick out a great piece that will look great on all of your bridal party, that they can incorporate into their wedding look as well! Simple pearls, or pretty delicate earrings would make a great gift that your girls will want to wear again! 2. The Dress- If you have enough room in the budget, consider paying for your bridal party's bridesmaid dresses. If you purchase them all together and pay up front, you will most likely be able to get a discount, and it is a really great gesture to show your Bridesmaids that you really care about them and are aware that they probably won't "shorten it and wear it again". 1. Book a Trip- Plan and book a little weekend trip for your bridal party to take together a few weeks after the wedding. It doesn't have to be anywhere exotic, just change it up from the norm. Plan an overnight in Newport, RI and take them on a sailboat cruise! You can hit the beach all day, shop, and most importantly have some fun!